Nothing shakes self-confidence like hair loss. Sure, there are tonics and shampoos that are supposed to help, but when it comes to something as tricky as hair loss, it's best to rely on straight science. 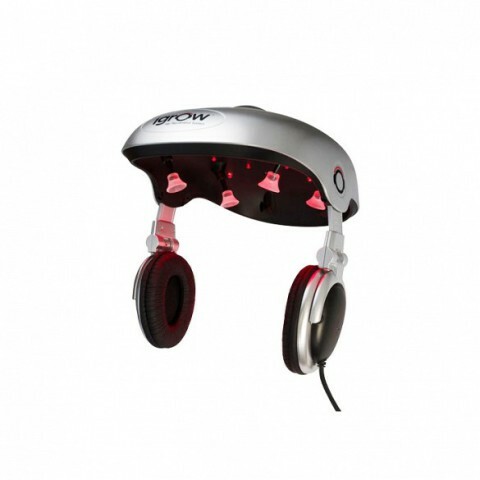 The iGrow Hair Laser Rejuvenation is a high-tech helmet that uses the latest in laser technology to regrow hair. Plus, it keeps extraterrestrials from reading your every thought. The iGrow Laser Hair Rejuvenation uses low-level light therapy to stimulate hair growth. The helmets emit lasers that are absorbed by the cells on top of your scalp. This stimulates energy in the tissue shells, creating fuller and thicker hair. Three to four 25-minute treatments over six months will leave you with beautiful, healthy hair. Although it doesn't say this anywhere on the product website, I'm pretty sure the iGrow helmet will keep all-seeing aliens from reading your thoughts. Get that tin foil off your head and give the iGrow a try! Hair growth and your paranoia can be under control thanks to one techy product. This is definitely a splurge purchase. At $695, you really need to commit to the process. If you're ready to get your hair back and you've tried everything else, the iGrow Hair Rejuvenation might be the solution you're looking for. Cell Phone With Concealed Firearm System: Great Idea? Worried Your Kids Aren't Learning Critical Thinking Skills? Tiddlybot Is Here To Help!